Thought I'd share with you the latest armament in my battle against the demons of middle-age angst - isn't he jolly? 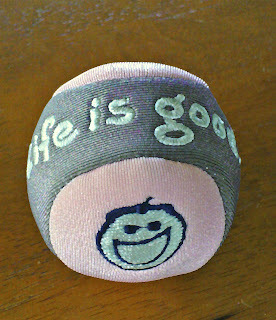 I was buying t-shirts (seeing as it looks like summer might be coming this year after all) when I saw a tub full of these stress balls near the till. Feeling particularly stressed as it was Monday morning and the first coach load of tourists had already disgorged grannies from the North of England onto the streets of Inverness to wreak havoc, I had to have one. I squish him when I'm angry and throw him up and down when I'm happy, so if nothing else I'm exercising my arm. You can check out the company and especially their cheery t-shirts here.